When Hozier wrote the song “Take me to the church” in an attic in Bray 4-years ago, he could never in his wildest dreams imagine he could have a week like he has had since last Saturday. In the last few days he has appeared on Saturdaynight live (See performance here) and reached number two in the American billboard charts with his debut album. The 24-year-old has sold nearly 58,000 copies this week. With first-week sales of 57,859 copies, He has become the second highest-charting new artist of 2014 in the US. The Bray/Newcastle singer – whose real name is Andrew Hozier-Byrne- has achieved international success, with the album at N0.2 in the Canadian Albums Chart, No.3 in Belgium and No.3 in the UK Album Charts. He has also secured Top 15 chart positions in Denmark, Holland and Germany. Fresh off a flight from London, 24-year-old Hozier (real name Andrew Hozier-Byrne) just arrived in Nashville for the start of what will be a six-week tour. “I haven’t really had a chance to see the American South yet, I’m looking forward to checking out more,” he says while finally resting in his hotel room. “Right now I’m kind of in the midst of a fogged and jet-laggy state.” For Hozier, his hectic travel schedule isn’t the only thing that’s disorienting. 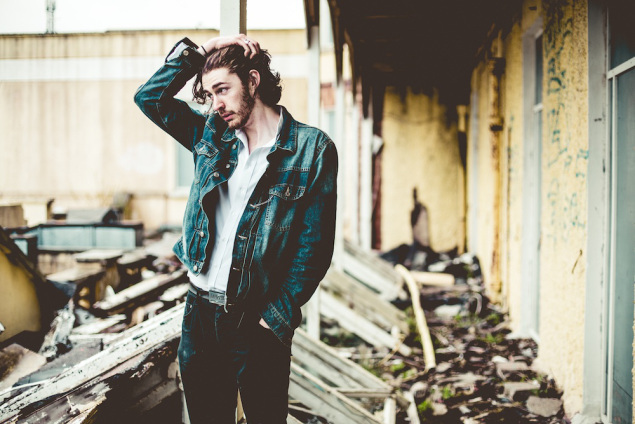 For a perceived overnight success, Hozier’s sudden music stardom is anything but. Interested in the craft throughout his high school years, it was while attending Dublin’s Trinity College he was performing a Bee Gees cover at a student concert when a rep from Universal Music Ireland was in the audience and promptly signed him. (Says Hozier, humbly looking back: “He just liked my voice, I suppose.”) From there, the 18-year-old was faced with a choice: drop out of school and pursue music or take the safe route and continue on with his studies. “My parent’s idea of success was academic success, and that’s how I was brought up- to achieve academically. There was a risk and they were worried, and we had these conversations about dropping out which were difficult.” However, when Hozier skipped out on his first year exams to record some demos for Universal, it sealed his fate and he left Trinity shortly thereafter.